The interior of the building was completely reorganised in 1817 and some years later a wall was built, totally obscuring the apse. A fire in 1863 did considerable damage and, in 1882, another extensive alteration was carried out which involved alterations to the galleries. The galleries were completely removed in 1950 allowing more light into the building. Canongate Kirk is one of the simplest buildings in Edinburgh. When they come in people are sometimes disappointed as a first reaction because there is nothing very grand or elaborate about the place. It is, however, a building which repays a little quiet study; it is a marvellous place for sitting and meditating. Its peace, harmony and unity are promoted by its architecture, with wonderfully balancing circles and semi-circles, arches and pillars. The clear windows let us see out and the world see in, so that there is no obstruction between the church and the community outside – the one flows into the other. So people coming in and quietly sitting down find a peace stealing over them which is remarkably refreshing and re-creating. But when they move about inside, to see what there is to be seen, they discover there is quite a lot, and all of it, in some way, a measure of the history of the building and the community, the congregation and the church itself. I think the first and most obvious thing people notice are the Colours which hang above the nave, standing out from the pillars and adding a splash of colour to the ceiling. 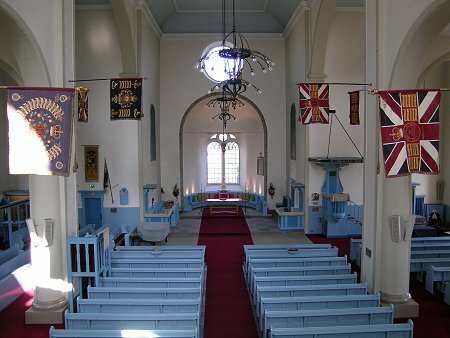 We have the Colours of the King’s Own Scottish Borderers and the ‘Dandy Ninth’, the Royal Scots (The Royal Regiment); in the King David Aisle to the right hand the standards of former Governors of Edinburgh Castle and on the other aisle that of the previous Minister, the Very Reverend Dr Ronald Selby Wright, and his Coat of Arms as Minister of Canongate. Straight ahead of that, over the boiler room door, is a banner which was woven by the Dovecot Tapestry of Corstorphine to commemorate the Coronation; it is that of the Very Reverend Dr Charles Warr who, at the time, was Minister of St Giles, Dean of the Chapel Royal and Dean of the Thistle. It hung above the pulpit in St Giles when the Queen came to Scotland and was acclaimed in 1953. This Banner is, therefore, an important historical ‘document’. It is flanked by the Standards of the Royal British Legion Scotland. These standards add a touch of romance and history and one can almost hear the sound of military music from long ago beating down from the Castle into the Kirk. For this is a military church, the Church of Edinburgh Castle, and it is fitting that they should be here. Perhaps the next thing that catches the visitor’s eye is the apse with its wonderful embroidered cushions which clothe the seats where the elders sit during the communion service. The embroidery itself is a series of cushions designed as a memorial to the Normandy Veterans Association, of which I am Chaplain. It has an interesting history: two of the veterans came to see me one day, a very serious deputation, asking me if it would be possible for them to have, somewhere in the church, a bronze plaque commemorating what they did during the war and in 1944 in particular. The idea of a plaque did not commend itself much to me and we moved through other possibilities until at the end I suggested an embroidery or something that would ‘clothe’ the apse and be a permanent memorial to them and, at the same time, an asset to the building. They were completely won by the idea and, there and then, decided that they would raise the necessary money. We had already been thinking how we could achieve some colour in the apse and there were one or two tapestry schemes afoot, none of them very good. This input from the Normandy Veterans and their enthusiasm set off a chain of events which finally ended up with a band of about twenty eight women who had been gathered together, keen to help in the project. Each of them undertook to work a cushion. The whole work was designed by Hannah Frew Paterson and is called ‘Christ, the Light of the World’. It is a double spectrum of light, flowing inwards from right and left, sweeping inwards in a wonderfully varied ray of colours and radiance to the central cross in the middle – an uplift to everybody’s spirits as they come in. People may be confused by the interior arrangement of Canongate: they walk in the door and see a pulpit; then they see in the apse two ‘boxes’, which some call pulpits too, and then they see again another pulpit – and wonder how the service is conducted. Actually, it is quite simple:the ‘boxes’ are in fact prayer stalls and prayers are conducted from one or other. The pulpit in the nave against the pillar is where the Bible is read and the other pulpit is used for preaching.Immediately in front is a new communion table which is the congregation’s gift to the Kirk to mark the millennium, the second millennium of our Lord’s birth. It was dedicated and used for the first time on Christmas Day 2000, and used also the following Sunday, the last day of the year and of the millennium. It has been used at every Communion Services since. It was designed by a young man, Bruce Hamilton, and it wonderfully resonates with the window behind it. Carved on its frontal is the double arch of the window with the gothic heart in the middle and on each side the stag’s antlers with the cross between them. The stretchers form a Saint Andrew’s Cross, topped by a roundel upon which is carved the coat of arms of the Kirk, beautifully painted in heraldic colours, matching the heraldry on the prayer stalls. One prayer desk was given by four dukes of Scotland in 1950: the Duke of Hamilton, the Duke of Buccleuch, the Duke of Queensberry and the Duke of Argyll. These Dukes represent families which, in the history of Scotland, were very important and were often enemies of each other. This particular stall is surmounted by a canopy which has on it the text in Latin ‘Behold how good a thing it is for brethren to dwell together in unity’. So the four warring families have come together in unity in Canongate Kirk. Opposite is a stall presented in the same year by the Duke of Roxburgh because the Roxburghs were the ‘superiors’ of the Canongate from the Reformation until 1636. (The ‘superiors’ means that the Crown gave them the entitlement to all the feu duties). The Duke of Buccleuch also gave a mediaeval wooded painted panel from his chapel at Bowhill which forms the back of the Beadle’s seat and also, opposite, a three seater bench with carved cherubs – a splendid piece of carving, lively, interesting and uplifting. These seats are named: one for the Dean of the Chapel Royal, one for the Minister Emeritus, who was Dr Ronald Selby Wright, and one for the Moderator (of the Kirk Session, the Presbytery, or of the General Assembly). In front of this bench are two carved prayer desks given by the St Margaret Chapel Guild, and nearby is a small statue of St Margaret, Queen Margaret, seated with her gospel book in her hands. It was made by Frances Rich, a sculptor in Palm Desert, California. She made two: one for St Margaret’s Episcopal Church in Palm Desert, where in the crypt they have an exact replica of the chapel in Edinburgh Castle, which they asked me, as Minister of the Castle, to dedicate in 1990, and this one. Before we leave the apse and return to the pulpits, on the floor are flagstones bearing the names of Ministers of Canongate Kirk in succession since the Reformation in 1560 to 1978 when I succeeded Dr Selby Wright. At the focal point of the apse, in front of the central mullion of window looking out to the Royal High School and Calton Hill, stands a cross, specially carved for the church. It has an interesting history: one night we suffered a severe break-in; much of the church furnishing was ruined, and this cross was smashed into two pieces. It has been put together so that we still have the cross as intended, but it is a fractured cross, broken almost as though it has broken its heard because of what happened. That rupture is, in a way, reflected in the only modern addition we made in the major renovation in 1990 – the glass doors at the entrance. There, on the etching which represents the Holy Trinity, is a cross, deliberately made as though it was refracted. Returning to the pulpits, that on the left in the nave is the scripture pulpit, really a lectern reminding us of the Old Testament experience of Ezra in the days of Nehemiah when a Book was discovered in the ruins of the Temple. It was brought out, dusted down, and identified as the Book of the Law. The people made a pulpit of wood for Ezra, the scribe, to go up and read it to them. The pulpit was amidst the people and that, I think, is what the pulpit in the nave signifies. It takes us right back to our roots in Old Testament times and locates us firmly in Hebrew history, theology and experience. The other pulpit is the one in front on the right, topped by a sounding board and from where sermons are preached. It has a fascinating history: it was formerly the pulpit in the Chalmers Memorial Church in the West Port in Edinburgh, built specially for the great Dr Chalmers after the Disruption. Previously, he had been the Minister in St John’s Kirk in Glasgow and a national figure, both in Scotland and England, and one of his notions was to encourage the building of new churches in the growing city housing areas. He went around the country, preaching the gospel, telling people about his vision and plans, engaging their interest and, if he could, capturing their offerings. He wrote several times to the Kirk Session of Canongate, seeking the privilege of coming to preach and receiving the offering for his work of what we would now call ‘church extension in housing schemes’. On each occasion he was refused. A century later, in the 1960s, his church was being knocked down for development in the West Port. Dr Ronnie Selby Wright heard of this, sped down in a taxi and was just in time to stop the pulpit from being demolished by a great ball on the end of a crane. He got a joiner carefully to dismantle the pulpit which he brought in bits to Canongate. It was rebuilt where it now stands, so that my a curious quirk of history, the man who was refused permission to preach in Canongate has, in a way, bequeathed us his pulpit from which every sermon is preached. On the west side of the pulpit are two features of interest. One is the baptismal basin holder. Baptism has been conducted in the Christian Church in three ways, depending on locality: in Roman Catholic and Anglican churches, in a font near the entrance to the building; in some churches in front of the congregation in a font as near as possible to the Communion table and lectern; and the old Scots custom was to have it done in the face of the people from the pulpit. The Minister would remain in the pulpit to which was attached an iron bracket holding a basin, usually pewter but sometimes silver, and he would lean over at the appropriate time to baptise the child who was held up by the father. Canongate must, I think, be one of the few churches which has a bracket set into the base of the pulpit and we are fortunate enough to possess the baptismal silver which was in the old Kirk down at Holyrood, given to the Kirk in 1644 – a wonderful silver bowl and ewer to which, in my time, has been added a baptismal spoon which is a replica of that made in Canongate in the 1560s. So we use that when the bairns and, indeed, adults are baptised in the old reformed Scottish custom. Above the bracket is the Royal Coat of Arms, placed there in 1991 and unveiled by Her Majesty The Queen when the whole renovation of the Kirk was completed. That was an exciting occasion and we are grateful that the royal connection is commemorated for all to see. Below those Arms is a second plaque commemorating the fact that the Royal Scots (The Royal Regiment) formally adopted Canongate Kirk as their Regimental Kirk, and we are very proud of that connection too. On the east side there is a Communion Table, backed by a reredos, both given by the High Constables and Guard of Honour of Holyroodhouse in the 1960s. The needlework for the frontal and reredos were done by two ladies of the congregation under the direction of Lady Margaret Grant. The former depicts the story of King David and the stag with the cross between the antlers and the founding of the abbey. The reredos shows the black rood of Scotland, backed by a lovely circle containing animals, which children enjoy counting and identifying. Until 2000 that table was used every Christmas Day for Communion and, formerly, for the monthly communion which took place in Dr Selby Wright’s day after the main 11.15 service. That service now takes place on the last Sunday of the month at the main service and so the St David’s aisle is not used so often. Nearby is a picture by Stanley Cursiter, the Queen’s Limner for Scotland. He was a young artist in the 1920s from Orkney, well known and much respected. When he and his friends were just making their way in Edinburgh, they conceived the idea that it would be a good thing if in all the primary schools there was an original work of art so that the children would be introduced not just to prints but to something that an artist whom they had met had actually painted and which told them something of the history of their own school and interesting about their locality. So we have this painting, based on a Pisanello painting which you can see in the National Gallery in London; it is almost an exact copy. It shows the King’s Park and Arthur’s Seat with the wild flowers and animals to be found there. As in the table frontal, mentioned above, you see King David kneeling before the white stag with the cross between its antlers. The whole painting is surrounded by mottoes in the old Scots language which take a bit of deciphering. There is an interesting tale attached to the picture: it was presented to the school in Cranston Street or New Street (depending on which entrance you used) and, after it was hung, there was correspondence in ‘The Scotsman’. Somebody had noticed that the cross in the painting was a crucifix and had written to the newspaper complaining that in a State, Protestant and Presbyterian school a crucifix had been infiltrated. There was a most terrific row, the picture was withdrawn and not allowed to remain on the walls. The young artists thought this was an act of censorship, they withdrew their support and this was the only picture to survive from a very imaginative scheme. It eventually came to light in the 1960s in the Royal Mile Primary School, then called Milton House School. They did not want to hang it anywhere public and asked Dr Selby Wright what they could do with it. He immediately suggested that it should be hung in the church where it now hangs between two windows, preserved from the light but visible for all, recording the founding of the Abbey at Holyrood. The King David Aisle is matched by the War Memorial Chapel on the west side of the church. On the back of the simple screen are inscribed the names of the men from Canongate who died in the 2nd World War, surmounted by a small figure of St Michael, the great archangel. There is also a memorial to the Dunkirk Veterans, containing sand from the beaches at Dunkirk and La Panne. It is flanked by a Roll of Honour of 603 City of Edinburgh Squadron RAF, which was unveiled by Her Majesty The Queen. Behind the Communion Table is a marvellous sculpture by Josephina de Vasconcellos called “Christus Victor”. It is a crucifix with a young man on a cross, surmounted by wings, and at the foot of the cross is a coiled serpent which he has evidently slain. The dynamic movement of this figure on the cross is of a thrusting upwards, vital young man reaching his destiny and the salvation of the world. Between the two windows is a Pieta by John Stenhouse which shows Christ being carried down from the cross. It is a moving, difficult painting which should, perhaps, be more a centre of devotion than it is. Also in this chapel is a small chamber organ, made about 1843. It is now powered by electricity although the original hand pump is still in place and working. It produces a delicate sweet sound, splendid for little recitals when all that is required is a dulcet, musical atmosphere. The Communion Table is a memorial to Dr. Warr. The two front pews in the church are special: that on the east is the Royal Pew, bearing the coats of arms of The Queen, The Prince Philip and The Prince Charles, Duke of Rothesay. When I came to Canongate the latter was represented by the arms of the Prince of Wales, but I had proper arms made, appropriate to his Scottish title. This pew is surmounted by a model of the Honours of Scotland – exact representations of the crown, sceptre and sword which are displayed in the Crown Room in the Castle. The other pew, the Castle Pew, has on its front representations of some of the great officers of the Royal Household: the Hereditary High Constable of Scotland, the Hereditary Master of the Household, the Hereditary Keeper of the Palace of Holyroodhouse, the Hereditary Standard Bears of Scotland, the Lord Lyon King of Arms, the Captain-General of the Queen’s Bodyguard, and the Governor of the Castle. Any of these can come and use this pew but in practice it is the Governor of the Castle who comes most frequently because he actually resides within the parish. There is also a seat reserved for the Lord Provost of Edinburgh, and the reason for this is that Canongate was originally a burgh church and the gift of the living lay within the baillies and magistrates of Canongate. When in 1856 Canongate and Edinburgh were joined together, the status of the church was retained. The gallery over the entrance, which is some places would be termed the ‘West Door’ but which, in fact, is facing south, is striking for three reasons: first there are the badges of some of the Guilds which survived in Canongate for many years – the cordiners, the wrights, hammermen, tailors, baxters (or bakers) and weavers. There were other guilds in the past and they all had the right, as members, to come and sit in their parish church, as indeed did the baillies and magistrates. In the centre is a clock which, it is reputed, came from Holyrood. It is a simple movement, a barrel and chain, and the face is surrounded by the motto of the Order of the Garter with supporters on each side – the lion and the unicorn – lying on a ground of thistles and roses. The whole was restored by Clunie Phipps in 1990. Immediately behind and between the windows is our Frobenius organ, built by the Copenhagen firm in 1998 in memory of Dr Selby Wright. What is interesting is that General Gow and I spoke to Dr Wright not long before he died, suggesting this organ to commemorate his long and distinguished ministry and that this seemed fitting as his father had been a well known organist in Glasgow and his grandfather similarly noted in the west of Scotland. He was delighted and steps were set in train at once to collect funds from his many friends, including members of the Royal Family, who would care to contribute. The result is a magnificent 20 stop instrument, beautifully voiced and specially designed to stand happily between the windows. For its looks and sound it is becoming recognised as one of the supreme instruments, not only in Edinburgh but throughout Scotland and, indeed, the United Kingdom. It is a monument to the organ builders’ art. We have a considerable collection of pictures which include photographs recording visits by members of the Royal House to their Kirk. These can be seen mainly in the vestibule where there are also war memorials. The picture collection includes a remarkable map of the Old Tow, architectural drawings of the building at various stages in its history, and prints of the church itself. Also in the vestibule is one of the most important historical documents in Edinburgh. It is in the form of a Mortification Board – a very large wooden panel of twelve sections, each recording gifts made to the Kirk of the Canongate from 1643 until about 1670. Its importance lies not only in its inherent significance but some of the gifts which are recorded are still with us, such as, for example, our old communion and baptismal silver. This board came to us from the old kirk at Holyrood when our new church was built here and the old one taken over as a chapel for the Knights of the Order of the Thistle and the private chapel of the King. As you leave the church, look round the kirk yard which, it must be remembered, is not, curiously, maintained by the church but by the Local Authority. You will see many interesting graves, details of which can be obtained from a leaflet in the church. This short description of this famous church was dictated by the Reverend Charles Robertson, Chaplain to Her Majesty The Queen in Scotland, and Minister at Canongate between 1978 and 2006. The tape was transcribed by Jenifer Davidson, and edited by General Sir Michael Gow. The illustrations were provided by Stuart Francis – all Elders. We all hope that you will find it of interest, providing details of a place which is a beautiful centre of Worship and also of musical excellence.